What They Don't Tell You About Pay "Gotchas"
When you hire an employee, it’s assumed you know about the Fair Labor Standards Act of 1938. 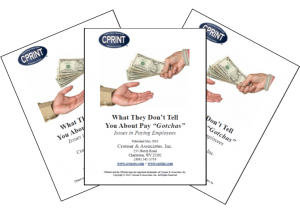 Tom Crouser reveals the most common “gotchas” he has seen over the last 30 years as well answers the most common questions owners have about payroll in our kinds of shops. Holiday and vacation hours, count for overtime or not? Plus, questions and answers from the field. Specifically: letting people go after 40 hours worked; paying family members; bonuses and overtime; extra minutes worked preparing or closing for the day; counting time; vacation pay for outside salespeople; and requiring employees to maintain telephone. This product is a PDF report which is delivered to you immediately (see receipt for download link), 19 pages.